As a form of profound insight or awareness, the act of enlightenment seems to embody divergent, yet symbiotic, temporalities. We might understand the process as sudden, a heightened consciousness that catalyzes a pronounced transformation. Yet, it is also something that comes with time. Rooted in a daily practice, in particular belief systems, enlightenment is a state continually strived for and difficult to attain. If we correlate it with the structure of thinking itself, we might picture synaptic energy moving quickly between nerve cells in the brain. Embracing the fluidity of meaning held within this notion, Gal Weinstein’s video Enlightenment (2017) functions simultaneously as a relatively straightforward representation and as a metaphor. In other words, it is a documentation of a process that intends to mimic an ephemeral physical phenomenon and an interpretation that functions largely symbolically, connecting the imagery to mythology and the unknown rather than to the scientifically proven. 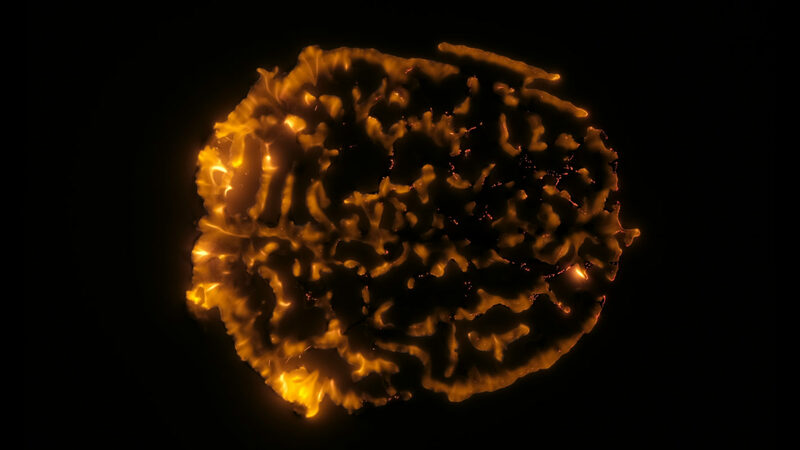 This mesmerizing short video captures a fire burning through a human brain. Visualized as a section, as in the now familiar pictures gathered from medical imaging techniques like PET scans, the shape of the lobes and tracks of the arteries are composed of lines of cotton wool. Lit on one end, the fire moves across the image, as if mapping the thought process itself. Lighting the material manifests a physical literalization of the metaphorical notion of enlightenment (to lighten, to illuminate). At the same time, the fire traversing the lines of the image to gradually reveal the transformation of the whole mirrors the dual conceptions of enlightenment as both spontaneous, almost accidental, and deliberate, requiring commitment and often just out of reach. Weinstein’s visualization of an act of destruction can be read as both a degradation – resulting in one natural element overtaking and causing the complete ruination of another – and a regeneration, suggesting that, as in a forest or with human skin, growth is sometimes best facilitated by the cyclical demise of part of the organ. Indeed, the artist’s orchestration of the flames upon a discrete composition brings to mind the controlled burning implemented by foresters in order to stimulate germination and protect the landscape from more catastrophic spontaneous fires. For a previous, related work (Fingerprint, 2010), Weinstein used the same process on a rendering of a human fingerprint. Interestingly, while the regeneration and rejuvenation of the skin is a natural process endemic to many animals, the fingerprint is, as we well know, unique to each individual person. It has thus become the primary identificatory tool used in criminal forensics and by border control agents. In fact, the fingerprint has become an instrument, and a symbol, for controlling access in our daily lives. Many of us now, for example, use our fingerprint to unlock our smartphones. Although some repetitive actions can wear away the tips of the fingers enough to make it impossible to gather a sufficient print for identification, attempts to erase one’s fingerprints through burning typically fails, as the damage is usually not deep enough and the regenerative capacity of the skin results in the reemergence of the coding. Although recent research on neurogenesis suggests that cells in certain regions of the brain may have some capacity for renewal, regeneration in an adult brain has long been understood to be quite limited, and the result of cellular damage and degeneration is most often memory loss. Thus, Weinstein’s brain on fire might indicate acute memory loss. While initially monochromatic and almost imperceptible, the structure of the brain becomes highlighted through the act of burning, which functions like a drawing device, yet the end result is the erasure of the image. The video’s exploration of memory from this seemingly scientific perspective is, however, quickly complicated. In the context of the exhibition and its site – the Israeli Pavilion located among the other national pavilions in the Giardini in Venice – and in relationship to Weinstein’s other works, the imagery begins to take up questions of historical and collective memory, as well as the role of allegory in the perpetuation of belief systems. On an adjacent wall to Enlightenment is the mural Moon over Ayalon Valley (2017), which responds to the biblical story of a miracle that illustrates the interplay between science and religion. Although this work references an allegory in which an irrational but steadfast belief in something impossible triumphs over empiricism and the accepted rhythms of the physical world, Weinstein’s Enlightenment serves as a kind of counterpoint. With the title’s nod to the Western period of Enlightenment, which espoused reason over belief, the artist acknowledges the push and pull between logic and faith, the real and the fantastic, the actual and the symbolic, which we experience in our daily lives. A powerful element – both endlessly seductive and undeniably threatening – fire figures prominently in countless ancient myths, major works of literature, and philosophical speculation. It has also been both a tool and a subject for a number of contemporary artists. The Chinese artist Cai Guo Qiang uses gun powder to create elaborate drawings in the sky or on land. And over the past decade, artists such as Eric Baudelaire and Walid Raad have called attention to the use of fire as a weapon in political conflicts. Already in the 1960s, postmodernists like Yves Klein and Andy Warhol took fire to the canvas in order to propose new techniques for painting that were nonetheless deeply connected to our most primal instincts. The Cuban feminist Ana Mendieta famously employed fire, among other natural elements, in her Silueta series in the 1970s. Her short film Alma Silueta en Fuego [Soul Silhouette on Fire, 1975] portrays a figure shrouded in cloth that is set on fire and seared into the landscape. Equally inspired by the empowering rituals of indigenous peoples and the traditions of Catholicism, Silueta en Fuego was also an indictment of the violence inflicted upon the body within specific cultural and political systems. A more overt critique of government oppression, Cildo Miereles’s performance O Sermão da Montanha: Fiat Lux [The Sermon on the Mount: Let There Be Light], which took place in Rio de Janeiro in 1979, revolved around a large cubic structure comprised of boxes of Fiat Lux matches and placed upon a floor covered with coarse paper. Structured as a gallery opening in a small basement space, the performance confronted visitors with five uniformed, anonymous men, who aggressively guarded the stack of flammable materials. Imbued with risk, the performance deliberately enhanced the sense of fear and uncertainty that Brazilians were feeling during this time of dictatorship. Although certainly more subtle, Weinstein’s Enlightenment seems perhaps most connected to these provocative works from the 1970s. Absorbed by questions pertaining at once to religion, the landscape, and politics, the video considers the human condition as one in which the physical body is also most certainly a cultural one, vulnerable not just to the inevitable vicissitudes of time and to the particularities of one’s genetic makeup, but also to the shared experiences of a culture, even those going back many generations.